I hate Christmas music. If there was one ‘genre’ of music that I try and avoid at all costs it’s the ‘holiday album’. Call me a killjoy, ask why I can’t just enjoy it, but outside of the one truly great Christmas song (Last Christmas by Wham! of course) I just can’t stand it. You can guess what I think of a Mariah Carey Christmas album. The opening rendition of Silent Night, which itself is way over sung and full of gospel choir cringiness, sets the tone for an album of Christmas standards and a few original songs that would just about ruin any Christmas party. Hark the Herald Angels Sing and O Holy Night do exactly the same, but it’s on the horrific closer Jesus Oh What A Wonderful Child where Mariah takes the role of that kid at the front of the school choir who’s convinced everyone enjoys it when they upstage the rest of them. Don’t worry though, it isn’t just traditional ballads that you get to enjoy here, original tracks Miss You More (At Christmas Time) and Jesus Born On This Day sound so similar that I genuinely had to check that I hadn’t accidentally hit repeat on my phone. Mariah ballads are always ridiculously over sung though and it’s the uptempo numbers that really sent me mad. Her delivery on Santa Claus is Coming To Town is annoying enough, but it’s the dance remix of Joy To The World that made me question exactly why I would force myself to listen to a Mariah Carey Christmas album on a boiling day in August. Of course the biggest moment of the album is the inescapable All I Want For Christmas Is You, a song that keeps coming back year after year like that scab on your arm that you just can’t shift. At least it’s catchy for the first 83628 times you have to hear it during December though right? Merry Christmas made me question if I should ever do The World’s Greatest Hits again but I’ve just decided to cancel Christmas instead. No one is getting anything from me this year. Will I listen again? : PLEASE NO DON’T MAKE ME. Best Track: That vine of that girl pretending she doesn’t know the intro to All I Want For Christmas Is You is pretty funny I guess. 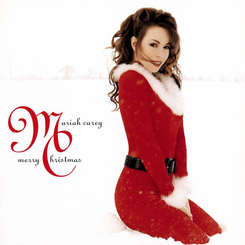 Tags: All I Want For Christmas Is You, Mariah Carey, Merry Christmas, The World's Greatest Hits. Bookmark the permalink.